shade. The other open space was treated as an open plaza. The grass surface provided a gathering space for the raised stage adjacent to the building. 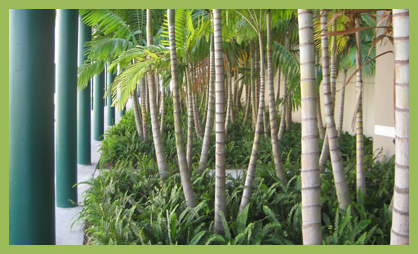 Along another side of that plaza, trees were planted to provide some shade along the perimeter where students would gather at tables and benches to grab a snack or get some reading done. Adjacent to the plaza spaces and within the raised gathering area pools, jets of water were added to shoot upwards from the pumps at the bottoms of the pools. Cascading waterfalls spilled water into the pools from periodic downspouts that protruded from the buildings’ walls. 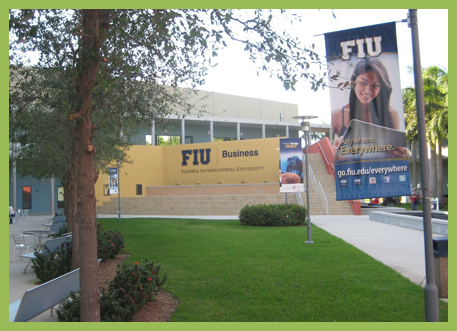 The entrance areas to the plaza space (at the corners mentioned above) were landscaped in colorful plant material including a specimen sized Royal Poinciana Tree in each corner. All green spaces were irrigated. as a unifying element as well. The athletic fields, as well as green spaces away from the buildings, were on a separate pump/well irrigation system in order to reduce HGHS’s water bill. An irrigation system connecting to the City water meter watered the areas adjacent to the school buildings in order to eliminate the discoloration of iron in the pump/well water.